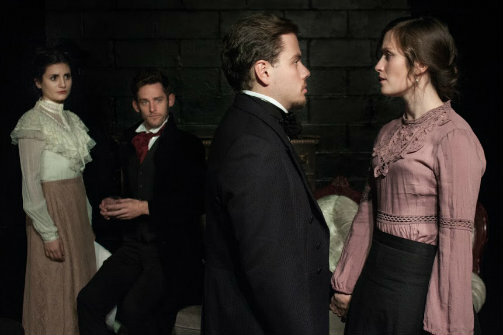 Produced by Theater for the New City and The Textile Co.
Juliette Monaco, Adam Reillly, Henrick Sawczak, and Elena Kritter in Victoria Woodhull. Photo by Lee Bader. BOTTOM LINE: A woman still has yet to win the presidential election. Victoria Woodhull shows us the first to ever try. Before Hillary Clinton, there was Victoria Woodhull. Theater for the New City undertakes a bold endeavor to tell the story of the first woman to run for president, who has curiously seemed to be wiped from mainstream history books. So, who exactly was this controversial woman? A stock-broker, proponent of free love, and a suffragette, Victoria Woodhull was impressively independent even before her presidential campaign. She’s spoken so highly of in the show's program that I couldn’t help being smitten with her before the play even started. Really, it sounds like she was an incredible person. Unfortunately, Victoria Woodhull cannot seem to put that woman onstage. Though the play makes a valiant attempt to win us over for Victoria, the narrative is a little too clunky, the direction a little too unclear, and the relationships onstage far too depersonalized to make sense of how we are supposed to feel or think about anything happening at all. Director Donna Mejia appears to have bitten off more than she can chew, as the technical requirements of the play seem to escape her. Smooth transitions are few and far between. This state of mild discomfort and confusion is the norm in Victoria Woodhull. As Woodhull, Elena Kritter makes a valiant attempt at showing us this incredible woman. Kritter conducts herself with a rare kind of poise and calm, but it cannot keep her from fumbling while navigating through a very tangled narrative with others who do not seem as willing to take the plunge with her. Ed Altman (playing Cornelius Vanderbilt) and Larissa Kruesi (as Harriet Beecher Stowe) also give performances of note. The rest appear to be lost in the dark abyss of that little East Village black box. It’s as if their characters are trying to talk to each other through a wall. At times, Victoria Woodhull breaks through this barrier beautifully. The scenes between Victoria and the other suffragettes, Susan B. Anthony (Monica Bell) and Elizabeth Cady Stanton (Collette Campbell), show the unshakable united front that they created (with Kruesi’s Harriet Beecher Stowe). Although these four women are all fighting for the same thing, it becomes painfully clear through Victoria’s failures that there are limited routes to success. The compromises the suffragettes must make come to a climax when they drop Victoria from their ticket. In-party political bickering isn’t just specific to our government now, it seems. We’ve endured centuries of bureaucracy, deals, and quite simply, just waiting for something to happen. Visually, the play is a treat. We’re welcomed by a pleasant Victorian drawing room, complete with an ornate couch, a wooden fireplace frame, and a damask-printed rocking chair. The costumes are a lovely amalgamation of swanky striped suits, delightful lacy dresses, and muted shades of blue, gray, and red: sensible, yet eye-catching. Although Victoria Woodhull falls a bit flat in trying communicating the grandness of this woman, it is a play that is keenly aware of how much we of the twenty-first century need to be thinking about women’s long fight for freedom in America right now. In the end, I was still with Victoria Woodhull. Victoria Woodhull is by Claude Solnik. Directed by Donna Mejia. Assistant Directed by Alex Gustafson. Lighting Design by Alex Santullo. The cast was Ed Altman, Monica Bell, Collette Campbell, Elena Kritter, Larissa Kruesi, Chaz McCormack, Ed McGlynn, Juliette Monaco, Adam Reilly, and Henrick Sawczak.